The 60beat Ranger Golf Watch - The Golf watch the provides GPS range data and it does not need to be recharged. 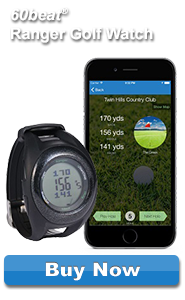 Combine the 60beat Ranger with the GPS Golf Watch app on your smartphone and transform your golf game. The watch provides distance to the Front, Middle and Back of the green for more than 34,000 courses Worldwide. The 60beat Ranger connects wirelessly to phone in seconds. Grabs the data and disconnects, saving valuable battery life on the watch and your phone. A GPS Golf watch can cost three times as much and needs to be recharged after each use. The 60beat Ranger provides the needed data without the hassle and at a much lower price. Wear the watch all day as a rugged sports watch or leave it in your golf bag for those days on the course. For iPhone and Android only right now. Free app in the Apple App Store or Google Play. The 60beat BLUE Heart rate strap and App combination transforms your iPhone into the ultimate training tool. No dongle required. 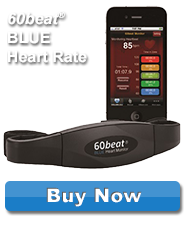 The 60beat BLUE Heart Rate connects wirelessly to the iPhone 4S, 5, 5S, 6, 6S and most newer android devices. The HRM delivers real-time heart rate data to the App of your choice. Compatible with more than 50 fitness, running, cycling and wellness Apps. Many Apps are free, including the 60beat Heart Rate App. The 60beat BLUE Bike Speed and Cadence the Bike sensor that transforms your iPhone into the ultimate training tool. 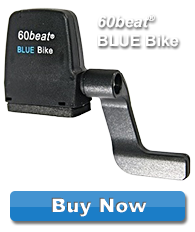 The 60beat BLUE Bike connects wirelessly to your iPhone or Android and delivers real-time speed and cadence to the App of your choice. Compatible with more than 20 fitness, biking and cycle training apps.